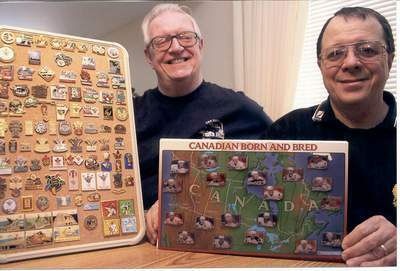 Wes (left) and Ron (right) of the Winnipeg Pin Collectors Club show off some of the pins in their collections. The Winnipeg Pin Collectors Club will hold a meeting on March 9th from 6:30 to 8:30 p.m. at the Vince Leah Recreation Centre, 1295 Salter Street. Feel free to bring along your spare lapel pins as there will be plenty of opportunities to trade pins with club members. The club meets the second Tuesday of every month at the same location. For more information call 667-6811.